Perhaps some of my readers recognised the avatars I have used in these pictures, but it is the Audience Avatar one gets and is required to wear when attended a performance of Paradise Lost. 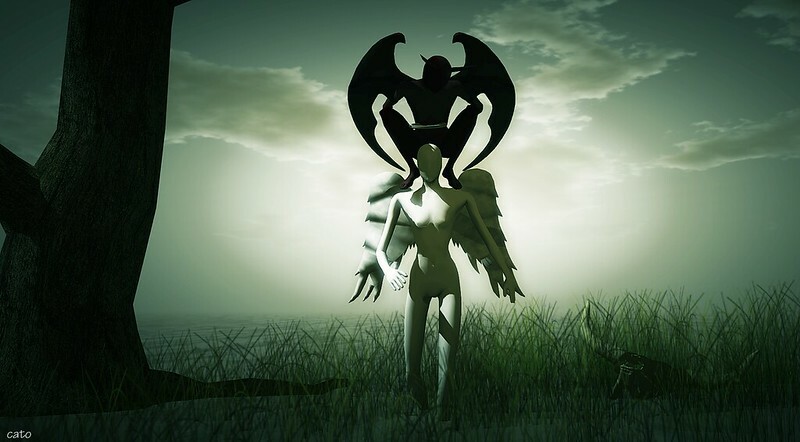 Now, the avatar included in the ticket is the Angel, and with all kinds of nifty techy tricks, Harvey and Becky transform them during the play into Devils – and back. My huge thanks to Harvey and Becky for giving me the opportunity to have a Devil, as this form of the avatar does not really exist as such! Don was so nice to play Angel, oddly enough he found this ‘normal’, something about him being the ‘Angelic one’? More information, backgrounds and behind the scenes reports on Paradise Lost by the Basilique Performing Arts Co. can be found on the official blog, the Audience Avatar is created by Sian (Sion Pearl) and only available when purchasing a ticket to the play, the pose on the first picture is ‘The Journey’ by Del May and on the second one I used ‘Heavy in your Arms’ by Exposeur. Next Post Such a poser!